In those days Israel had no king; everyone did as they saw fit. Judges 21:25. Naomi peeked from behind the tent flap. Girls emerged from scattered booths, illuminated by the flames of the bonfire. The beat of a timbrel echoed over the vineyards while tambourines tinked in thanksgiving to God for an abundant crop. Naomi’s stomach hollowed at the thought of joining in the revelry at the harvest celebration. She had never danced before at the feast in a manner to seduce a husband. Her palms dampened. It was almost time. Time to twirl and catch the eye of a landowner. 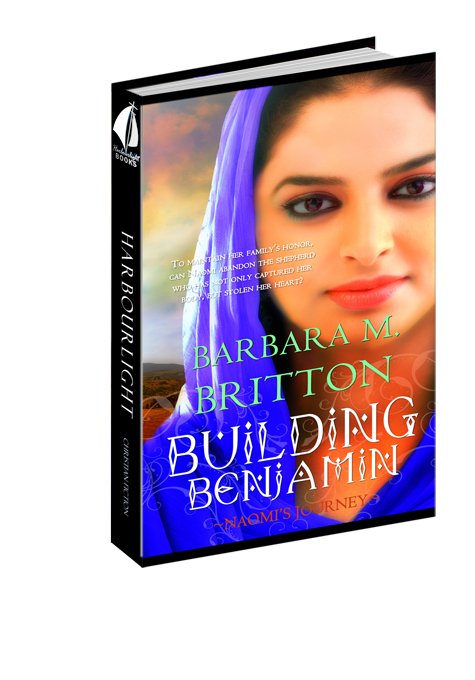 With two of her brothers slain by the Benjamites, her father needed a bride price. Movement in the moon-shadowed vineyard caught Naomi’s attention. Had a goat gotten loose among the vines? She squinted into the darkened rows of naked stalks. No leaves shook. No trellis gave way. No bleating rang out. The smoke is deceiving me. She blinked and retreated from the open flap. Naomi prayed this was not a lie. Cuzbi had danced the previous harvest, and the one before, but Cuzbi’s father had not received a single shekel. Naomi’s nerves fluttered like a wounded dove. She brushed a hand over her ringlets. A lone braid kept her curls from obscuring her face. Losing her brothers’ wages meant more time at the loom and less time adorning her hair. Her dyed sash would have to entice the spectators, for unlike Cuzbi’s adorned robe, Naomi’s was pale as a wheat kernel. Before she could check her appearance in her polished bronze mirror, Cuzbi grabbed Naomi’s arm and jerked her out of the tent. “The men will arrive soon from their feasting.” Cuzbi’s gaze darted about the clearing as she surveyed the ring of virgins who pranced around the fire. Young women in colorful linen swayed to the music. “Ah, there is an opening near the front of the procession.” Cuzbi sprinted into the circle. Naomi raced after her friend and ducked nearer the fire, next to Cuzbi. Dancers bumped Naomi’s side, jostling to be seen by their mothers and ultimately the eligible men making their way from the banquet. Hurry, Father. How much roasted lamb and wine did the men of Ephraim need? Waving to her mother, Naomi signaled her arrival into the mass of whirling bodies. A bead of sweat trickled from her temple and slithered down her cheek. She swiped it away and raised her hand in praise to God. She lifted the other and pretended to card wool in the wind. Cuzbi leapt in the air and swung her arms as if they were waves rolling off the Jordan River. Not ready to leave the hard ground, Naomi kicked up her heels one at a time, careful not to injure any followers. Her stomach balked at any elaborate jumps. A scream rose above the music. Then another. Had someone fallen? Been burned by the fire? From the fields, half-naked men wrapped in loincloths rushed into the circle of dancers. Naomi froze, even though the tempo of the timbrel remained festive. These were not the bathed and robed men of Ephraim coming to celebrate. These were armed warriors. She breathed a prayer of praise that her surviving brother imbibed at the banquet. A charging intruder whipped a sling her direction. Covering her head, she crouched under the whoop, whoop, whoop of his weapon. “God protect me,” she prayed. Music stopped. Wailing started. Naomi looked up. A raider scooped Cuzbi off her feet. He slung her over his shoulder as if she were a small child. The strong-armed man vanished into the surrounding vineyard with her friend. Another assailant plucked a virgin from the scramble of dancers. Naomi reached to grab hold of the girl’s outstretched hand, but a bear of a man blocked her rescue. His weapon whirred in flight above his head. Naomi dove to the side and crashed to the ground, careful to avoid the flames. Crawling like an asp over a flat-topped boulder, she headed for the fields. A raider grasped at her sleeve. His nails scraped her skin. Pain sizzled down her arm as if embers from the fire had embedded in her flesh. “Kelev. Kelev katan.” The high-pitched insult grew closer. Naomi glanced backward. A scowl-faced boy ran toward her attacker. Her young savior slashed a pointed stick at the assailant, snaring the leather sling. She had seconds to escape. Praise be to God! She fled into the harvested rows of vines—in the opposite direction from where Cuzbi had been taken. Racing along the rows of plants she’d played among as a child, Naomi’s heart lodged in her throat, strangling each breath. Curses trailed after her. Curses about her speed. Curses in…Hebrew? Her own tongue? Banking right, she panted as if these bandits had also stolen the night air. She sprinted toward the broken trellis, needing a shortcut through the barricade of vines. If she made it to the olive grove, hiding would be easy among the trunks and branches. Had her sole remaining brother been lazy? Or had he replaced the worn trellis before his revelry? She prayed he’d forgotten his duties this once. Her hand hit the cracked wooden rod. Splintering, it gave way. “Selah,” she exclaimed under her breath, for this one time, her brother’s laziness was praiseworthy. Ducking under the greenery of the grape plants, she darted toward the station of olive trees. Her sandals thapped against her heels. Certainly the raider would hear her flight, but slowing her pace would put her in peril. Oh, where were the men of Shiloh? Her father? Her brother? And why were these warriors invading a religious celebration? She passed one olive tree. A second. A third. A fourth. With trembling hands, she beat at the shoots from a tree and buried herself amidst the leaves. She listened for her follower. No footfalls. Good. Her chest burned, greedy for air. She stilled, but couldn’t silence her breaths. In and out they rushed, sounding like a saw on cedar. Old-growth trees were not far away. She scrambled down another aisle for better cover. Grabbing an olive branch, she propelled herself behind a trunk. She hit something hard. The bark? Her forehead ached as though a rock had pelted her skull. Flickers of flame dotted her vision. When she went to massage her temple, someone seized her arm. A palm smothered her lips. The taste of salt and soil seeped into her mouth. Her back struck the prickly growths from the tree. Protests lodged in her throat. Darkness surrounded her, but she kicked at where her captor’s legs should be. Banishing the dainty kicks of the dance, she thrashed to do damage. Her attacker did not turn aside. He pinned her to the trunk and held fast. Lewd taunts grew closer. Her pursuer from the vineyard was in the grove. Oh, God, do not let me be defiled by one man, let alone two. “Answer me quietly. Are you one of the virgins?” Her captor’s command came forth in Hebrew. He lifted his hand from her mouth, leaving barely enough space to answer. “Shhh.” Her captor pressed his warm palm over her lips. Instantly, she was pulled to the ground. Her captor pinned her hips to the dirt with his weight. He lifted her robe. Cool air bathed her knees, sending a chill throughout her body. She fisted his hair. “Spare me.” Even with all her strength, she could not remove him from her body. Her heart pounded louder than a ceremonial drum. He caged her in the dirt and sent his lips crashing into hers. She squirmed. Her stomach lurched. Her lungs ached. She needed a breath. She needed a savior. His weight pressed against her belly. Though he did not take her hem above her thigh. And he did not take her virginity. “Argh.” A roar split the night sky. “Eliab, what are you doing?” The bear-man stood over them, huffing from his pursuit. Her captor finished his kiss. “Lie still.” His words rumbled against her ear. The side of her face prickled from his stubble. He had not! This man, Eliab, had rested upon her, but he had not joined with her. Although if her father or brother caught him atop her, they would beat him until he claimed her as a wife, or offered a hefty sum. She was not about to call Eliab a liar with her pursuer from the fire crouched over them, staring wickedly. Why had Eliab lied? Was he a friend to the tribe of Ephraim? A friend to a tribe of Israel? “Go on, Gera.” Eliab rose, bearing his weight on his forearms. “Find another. We must leave at once. Hurry. Or do you care to look upon another man?” Eliab’s question shot out like a well-aimed arrow. Gera hesitated. He spat at Eliab’s feet and retreated toward the bonfire. Her spine sank into the ground. Thanks be to God. She reached to right her robe. Eliab gripped her wrist tighter than a gold band. Realization of his intent sent her heartbeat on another gallop. He had not been a brute, yet he held her prisoner, and he did not seem set on releasing her. “I cannot deny a fellow Benjamite a wife and then fail to claim her for myself.” With a jerk, he coiled her into his chest. “One of the few that remain after the slaughter.” His words were sharp as a blade. Naomi picked up her feet in hopes Eliab would be pulled off balance. He remained rooted to the soil. “I risked a raid for my survival. Benjamin will not be cut off from God. Our women and children have been slain. Our men ambushed in battle. Are we to have no heirs?” The anger simmering in his reply caused a shiver to rattle her bones. “Gera’s kinsmen brought destruction on our tribe. If a name is to suffer extinction, it should be his, not mine.” Eliab yanked her off her feet and heaved her over his shoulder. Her temples pulsed as blood rushed to her brain. Fainting would only make his escape easier. She closed her eyes and concentrated on the darkness. He cinched his hands around her calves and ran. Fast. His shoulder bludgeoned her belly with every jump and jolt. Her stomach spewed up manna and grapes, burning her throat, and muffling her screams. When his collarbone was about to impale her side, he righted her next to a mule hidden from sight among the brush. She slumped to the ground. “There was no union.” She beat his chest for emphasis. Her knuckles bruised, yet he barely moved. He pressed his thumbs into her palms and stilled her assault. “No one will bless a union with a Benjamite. No one will give us their daughters. We are left to kidnap Hebrew women. Since I stole you, your father will be held blameless before the elders of the tribes.” He stood and yanked her to her feet. “Others may not have been rewarded with a mate tonight. Shall I send you into their bed and disappoint my father?” No joy rang from his words. He did not seem giddy like a bridegroom in a marriage tent. She stepped backward. Could she outrun him in the darkness? She had to. This was her home. Her land. Her tribe. He caught her wrist and wrapped it with rope. Stray strands scratched her skin. “Most of my family is buried in a mountain.” He unhitched the mule and snapped the reins. Her body stilled as if encased in clay. Eliab wasn’t listening to her hardship. Distant shouts echoed from the vineyard. “Father.” Her voice squawked like a strangled pigeon. Was he going to trap her kin like wild beasts? In a blur, he mounted his ride, still holding the rope as if she were a wayward goat. How could she leave Shiloh? Leave her mother? Leave her father? Her legs trembled as if the ground shook. She did not take a step. With no arms for balance, she fell on her side. Her jaw ached from the gag. Coughing, she tugged on the rope and struggled to rise. If he kicked the animal, she would be dragged through rock and dirt. She grabbed the animal’s mane, weaving her fingers into the coarse hair for balance. How could the tribe of Benjamin thieve wives from the tribe of Ephraim? Where was their honor? Where was their shame? And where was God? The feast this night was in His honor. While Eliab was intent on the terrain, she worked a silver band from her finger and let it slip down her leg, down the mule’s withers, to the ground. She would leave a trail for the men of Shiloh. For what was lost could be found. Question 1: Why did you decide to write this Bible story? Answer 1: I didn’t know this Bible story existed until I was reading through Judges and stumbled upon the chaos. I mentioned the story to my son who was in high school at the time and he didn’t believe that it was in the Bible. He read chapters 19-21 and laughed when the Benjamites kidnapped the girls from Shiloh and ran off with their future wives. How could I pass up a story my son found so funny. Question 2: Why are the Benjamites important? Answer 2: Saul, the first king of the Israelites, was from the tribe of Benjamin. The apostle Paul (formerly Saul of Tarsus) also came from the tribe of Benjamin. If the tribe did not exist, these men would not have been born. Question 3: Is there a verse that sums up this time period in the Bible? Answer 3: Judges 21:25 states, “In those days Israel had no king; everyone did as he saw fit.” Some of the Israelites had abandoned God’s moral law and were living according to their sinful nature. We see the immorality of the tribe of Benjamin on full display, but we all need to examine our hearts and make sure we are producing the fruit of the Holy Spirit. Question 4: Where does Naomi get her strength? Answer 4: Naomi recites a verses from Deuteronomy (6:18a) which encourages the Israelites to trust in God as they lay siege to the Promised Land. Naomi needs to trust God to keep her safe and to give her wisdom. She does what is “right and good in the Lord’s sight” in her dealings with Eliab and his family. Question 5: Why does Eliab wait to make Naomi his wife? Answer 5: Eliab is mourning the loss of his family. A family he had the job of burying. He loses two sisters in the battle to destroy Gibeah. Eliab understands the grief Naomi suffers for the loss of her brothers and does not want to cause her more pain. He would like love to flourish in their relationship. I guess you could say Eliab is thinking of long term happiness instead of instant pleasure. Question 6: The women in your story all seem to want different things. How did you characterize them? Answer 6: At times I think of the story of the three bears. Cuzbi was excited to be chosen by an elder. She hadn’t been fortunate in having a choice of suitors and Ashbanel stole her heart—literally. Jael desired someone to protect her and provide for her since she was the daughter of a poor widow. Isa fit the bill. Naomi was ice cold since she despised the Benjamites. Eliab and God had to warm her heart to stay and rebuild the tribe. Question 7: The Bible account in Judges 21 has no battle between the Benjamites and the tribe of Ephraim and Manasseh. Did you add to the Bible? Answer 7: “Building Benjamin: Naomi’s Journey” is a work of fiction. The tribal elders mention the fathers will complain about the raid but the text doesn’t show this conflict. I added more tension with the made up battle, but the essence of the story comes from history. Question 8: Are you a Bible scholar? Answer 8: I wish. My husband is an ordained minister so I have listened to many, many sermons. My basement is a library of Bible commentaries and Christian books. I have been fortunate to be in Bible studies for many years and have had the privilege to teach chapel to kids, but I don’t have a degree in Biblical Studies. Question 9: Do you have any more Bible stories planned? Answer 9 . I am working on one now from the time of Nehemiah. I also have a story from the New Testament rolling around in my brain. Question 10: What was the hardest part of this book to write? Answer 10: I do not think I will ever write an “enemy to lover” story again. It is difficult to write authentic love when it happens in a short period of time. I hope you felt that Naomi and Eliab loved each other and would have a beautiful life together.